Reviving this article from almost three years ago. We now have parts of the Trump administration admitting there’s human-caused global warming and it’s too late to stop it. And yet, the denialist lobby hasn’t lost a footstep–Trump is still saying he doesn’t believe in global warmin. 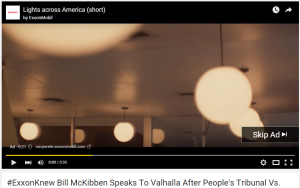 Exxon (the world’s most profitable company) purchases ad space on YouTube’s video of 350.org’s People’s Tribunal VS Exxon. If you click on this link about Exxon’s lies, you’ll be ‘treated’ to an Exxon ‘feelgood’ ad about why we need oil. #ExxonKnew.